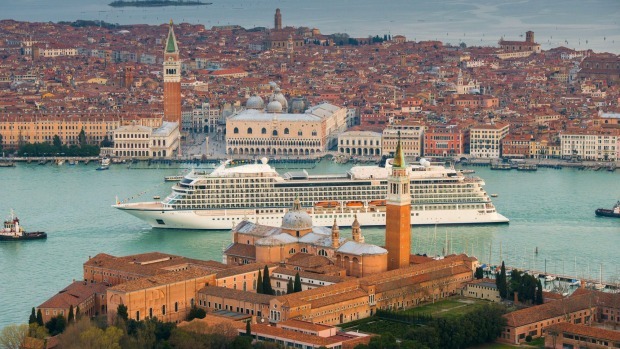 The Viking Sea's maiden voyage, sailing out of Venice. I know I'm on a good ship when I return to my cabin on my first day and find a bookmark tucked into the book on my bedside table. I'm ridiculously pleased with this attention to detail, feeling it bodes well – and I'm not wrong. Over the next few days, I notice signs of excellent service everywhere. Waiters wrap my teabag string around the handle of my cup so the label doesn't fall into my tea. The housekeeper notices that I don't have enough hangars and volunteers to supply more. Greeters stand at the gangway after every shore excursion with wet towels and warm smiles. Indeed, there are so many smiles and "good mornings" on Viking Sea that I wonder whether the company infuses the drinking water with magic mushrooms. I could put the happiness down to new staff with new jobs, since Viking Sea has only just floated out of its Venice shipyards, but it isn't that simple. Some staff have been relocated from sister ship Viking Star, while others have come from rival companies after years at sea. But whatever the reason, Viking Sea provides the most pleasant, professional service of any ship I've been on in recent years, setting an on-board atmosphere that carries over to passengers' whole enjoyment of their holiday. Viking avoids bandying around the word "luxury", but service-wise attains that description in all but name. And though Viking Sea is larger than ships of luxe rivals, it shares some traits such as uncrowded public areas. It also notably avoids glitzy amenities. "I don't think our passengers care about a casino," Viking owner Torstein Hagen once memorably remarked. "They'd rather have a free laundry." Decor is elegant and understated, and what Viking Sea lacks in top-quality materials it more than makes up for with an outstanding eye for interior design. Muted colours, Scandinavian chic and light-filled spaces are carried through public areas and cabins, giving the ship a unified, streamlined look. There's lots of pale northern wood (birch, pine, white ash), woven textiles and natural materials such as limestone, slate and leather. Occasionally, designer chic intrudes, with various public spaces graced with Mario Bellini and Frank Gehry chairs. Viking Sea is the second of Viking Cruises ocean vessels; the first, Viking Star, set sail in early 2015. Nearly identical to its predecessor, Viking Sea is a mid-sized ship carrying 930 passengers and recalls Viking's Longship river ships in its decor and friendly informality. Like river cruises, there's an all-inclusive ethos, still unusual at sea. Viking Sea offers complimentary Wi-Fi, dining (including in premium restaurants), mealtime drinks and a shore excursion in each port, with further paid shore-excursion choices. The complimentary half-day excursions don't move beyond general overviews, with large, slow-moving groups, but they provide an introduction to each port's layout and history, usually with free time afterwards. Those familiar with Viking river cruises will also recognise the company's educational ethos, with an emphasis on on-board lecturers, destination-related movies and the culture of port destinations. My western European cruise included intelligent lectures on the Eurozone crisis, Spanish art and the history of seafaring; a thoughtful selection of library books covered travel, history and exploration; and an excellent classical concert in the theatre provided dazzling Chopin from pianist Tomono Kawamura. Passengers are mostly retired, well-educated and curious about the places they visit. The ship has several public spaces, and it's hard to settle on which is the most inspiring. What they have in common are ample seating areas in small, intimate groupings with a rather homely feel. A three-storey Living Room is far more used than the usual ship's atrium, with tiers of comfortable seating, plenty of sociable nooks scattered with books and games, a bar, live music and guest relations desks; Viking Sea has done away with the dreary ship reception area. The Wintergarden provides another unusual, highly successful shipboard space, wedged under a glass ceiling near the pool and covered with a striking canopy of pale beech wood; it's a lovely, sunny spot for afternoon tea. The retractable glass ceiling slides out and covers the entire pool deck, making it a delightful indoor-outdoor area that can be used in any weather. My favourite spot, however, might be the Explorer's Lounge, which sits high in the prow of the ship with floor-to-ceiling windows onto the ocean. It's a fine space for an after-dinner drink, or a great place to curl up on a sofa during the day; its loft-like second floor is nearly always quiet, and scattered with an intriguing array of books and seafaring curios. The other public space of note is the expansive LivNordic spa and fitness facility. Its Thermal Suite, which is complimentary, displays yet more Viking flair for gorgeous decor. It has a beautifully lit warm-water pool and adjacent hot tub surrounded by both ceramic and regular loungers, and looks onto what appears to be a wall of fire (it's actually cleverly lit steam). You can also hop from a sauna to a snow grotto, or dare to stand under a wooden bucket and have cold water dumped on your head, Norwegian style. And so to the cabins. I'm in a Veranda cabin (number 4119), at a generous 24 square metres the smallest cabin size. All Viking Sea cabins have balconies, king-size beds (which can be divided into twins), desk and sitting area. Amenities are similar in all cabin categories, varying only in inconsequential touches (fruit baskets, binoculars, welcome champagne) and complimentary services such as shoe shining and laundry. Bathrooms have pleasurable luxuries such as heated floors, anti-mist mirrors and gushing showers. 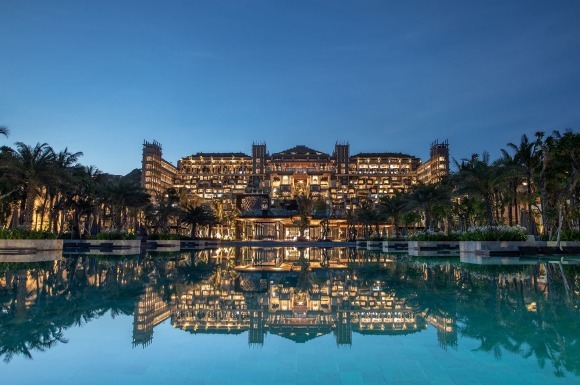 Consideration to detail is apparent elsewhere too, with both European and American sockets (Australians will still need an adaptor), interactive flat-screen televisions on which you can make restaurant and spa bookings, and robes and slippers. And, of course the twice-daily ministrations of the housekeeping staff, with their fresh towels and bottled water, bookmarks and smiles. If you're going to take a cruise, Viking Sea provides a mighty fine way to sail. Viking Sea has all-inclusive dining that covers all restaurants and 24-hour room service – impressive considering most cruise lines are currently increasing the number of their paid specialty restaurants. Soft drinks and table wines are also included at mealtimes. The main dining venue offers a variety of group and couples' tables, though tables for two are so close you can't avoid chatty neighbours. Breakfast has interesting offerings such as kippers or lamb chops. The evening menu has a good range of daily changing choices, and gets the thumbs up for regional tasting menus – I had an excellent zarzuela (Spanish seafood stew) while cruising from Cadiz. The buffet venue is akin to the cooking stations found in some hotel restaurants. Chefs at an open kitchen prepare some dishes to order and many others in small batches: there's sensibly more emphasis on quality than a vast array of congealing choices. Passengers help themselves to salads, bread, desserts and (in the evening) some impressive sushi and sashimi. This informal, specialty restaurant offers Italian fare including pasta, risotto, secondi such as veal scallopini and fish, and tiramisu and pannacotta. The capellini with zucchini-wrapped prawns in a light, lemony sauce is alone a dish that shows how Manfredi's outclasses other Italian restaurants at sea. Viking Sea's other specialty restaurant has an interesting concept, offering a set five-course menu with matching wines, changed every three days. There are seven themed menus. For my palate, the Asian Panorama provides odd ingredient combinations, flavourless dumplings and a lacklustre dessert, though the Peking duck was tasty. This small, popular, somewhat crowded lunch venue allows you to sit around the lovely pool deck. There's a small salad bar and tasty pizzas; otherwise passengers order premium burgers and hotdogs with sides of fried and onion rings. Across the pool's far side, the Wintergarden serves up an afternoon tea of three-tiered nibbles plus (in case enough is never enough) scones with clotted cream. This small food station offers light, Norwegian-inspired food. Open-faced sandwiches such as cured salmon on rye bread are delicious, as is the apple cake; the late-night split-pea soup (which ought to be eaten by the fireplace, nestled into a reindeer-fur throw) is another pleaser. Viking Sea sails various itineraries around the Mediterranean, the Baltic and the Norwegian fiords. In April each year, it connects the southern and northern seas on a 15-day Passage through Western Europe cruise from Barcelona to Bergen. The same itineraries are offered on sister ship Viking Star, which has also started cruising in North America and the Caribbean. Brian Johnston travelled courtesy of Viking Cruises.